Coahuila is a state in Northeast Mexico that is divided into 38 municipalities. According to the 2015 Mexican Intercensal Survey, Coahuila is the 16th most populous state with 2,954,915 inhabitants and the third largest by land area spanning 151,846.16 square kilometres (58,628.13 sq mi). Municipalities in Coahuila are administratively autonomous of the state according to the 115th article of the 1917 Constitution of Mexico. Every three years, citizens elect a municipal president (Spanish: presidente municipal) by a plurality voting system who heads a concurrently elected municipal council (ayuntamiento) responsible for providing all the public services for their constituents. The municipal council consists of a variable number of trustees and councillors (regidores y síndicos). Municipalities are responsible for public services (such as water and sewerage), street lighting, public safety, traffic, supervision of slaughterhouses and the maintenance of public parks, gardens and cemeteries. They may also assist the state and federal governments in education, emergency fire and medical services, environmental protection and maintenance of monuments and historical landmarks. Since 1984, they have had the power to collect property taxes and user fees, although more funds are obtained from the state and federal governments than from their own income. The largest municipality by population is the state capital Saltillo, with 807,537 residents, while the smallest is Abasolo with 1,015 residents. 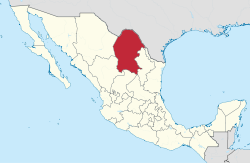 The largest municipality by land area in Coahuila and the third largest in Mexico is Ocampo, which spans 26,064.30 km2 (10,063.48 sq mi), and the smallest is Allende which spans 252.01 km2 (97.30 sq mi). The first municipality to incorporate was Monclova on August 12, 1689 and the newest municipality is Francisco I. Madero, which incorporated December 2, 1936. ^ In 1918 the name was changed from Abasólo Nuevo. ^ The Congress of Coahuila changed the municipality's name from Villa de Patos on December 29, 1892. ^ Guerrero was originally incorporated as Rio Grande, changing its name on March 18, 1834. ^ On August 7, 1827, the name of the town was changed from San Fernando to Villa de Rosas, and then to Rosas on October 4, 1857, and finally to Zaragoza on February 27, 1868. ^ a b c d "Número de habitantes". INEGI (National Institute of Statistics and Geography). Archived from the original on July 2, 2017. Retrieved July 15, 2017. ^ a b Estado de Coahuila. División Territorial de 1810 a 1995 (PDF) (in Spanish). Mexico: INEGI. 1996. pp. 89–97. ISBN 978-970-13-1491-3. ^ "Enciclopedia de Los Municipios y Delegaciones de México Estado de Coahuila de Zaragoza". H. Ayuntamiento de Escobedo. Retrieved May 26, 2018. ^ Estado de Coahuila. División Territorial de 1810 a 1995 (PDF) (in Spanish). Mexico: INEGI. 1996. p. 113. ISBN 978-970-13-1491-3. ^ Estado de Coahuila. División Territorial de 1810 a 1995 (PDF) (in Spanish). Mexico: INEGI. 1996. p. 114. ISBN 978-970-13-1491-3. ^ Estado de Coahuila. División Territorial de 1810 a 1995 (PDF) (in Spanish). Mexico: INEGI. 1996. pp. 158–159. ISBN 978-970-13-1491-3.